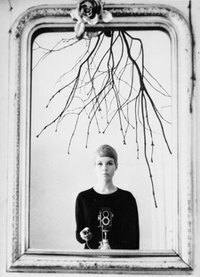 Astrid Kirchherr, self-portrait, 1960Can one woman’s personal style actually change a generation? In the case of Astrid Kirchherr, it did. Yesterday’s episode of Fresh Air on NPR featured an interview with Ms. Kirchherr which should not be missed. In 1960, Astrid Kirchherr met a group of young (some even underage) boys who were playing in a rock band on the Ripperbaum in Hamburg, Germany. According to Kirchherr, this was not an area of town where nice girls went out at night, but she went with her then boyfriend Klaus Voormann. The band she saw was The Beatles – popular culture and fashion has never been the same. Kirchherr was attending art school at the time and was practicing as a photographer. The story goes that she gathered up The Beatles one morning, took them out to an abandoned fun fair and took the famous iconic images of the band in its early days. The Beatles then featured Harrison, McCartney, and Lennon of course, as well as Pete Best on drums, and “the fifth Beatle” – Stuart Sutcliffe. Sutcliffe was a painter by trade and talent, but sold a painting to buy a bass guitar at the request of John Lennon who really wanted Sutcliffe as part of the band. The Beatles by Astrid Kirchherr, 1960 - Best, Harrison, Lennon, McCartney & SutcliffeAfter a few weeks in Hamburg, Sutcliffe and Kirchherr fell in love and became engaged. Sutcliffe left The Beatles, McCartney moved over to the bass, and a few years later Pete Best was replaced by Ringo Starr. Sutcliffe went on to borrow a collar-less corduroy suit from his girlfriend which she had made herself after seeing a high-fashion version by Pierre Cardin in a magazine. John Lennon initially made fun of the look, but later on adopted it along with the band to create one of their signature styles. 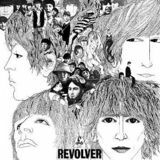 Klaus Voormann's "Revolver" cover - 1966Klaus Voormann went on to create the famous cover art for The Beatles’ Revolver album in 1966, and The Beatles went on and became history. After leaving The Beatles, Stuart Sutcliffe went back to art school in Hamburg. In 1962, Sutcliffe collapsed and died of a brain hemorrhage at the age of 21. Astrid Kirchherr states that he was, and is, the love of her life. She says that she still wears black, cuts her hair short, wears long scarves and leather pants, and is looking forward to her 70th birthday this year. Imagine it: the contents of your closet, your personal style, one day gets “borrowed” and blown up by some close friends who become mega-stars. How would your style change the world? Listen to the full interview between Terry Gross & Astrid Kirchherr on NPR. The story of Astrid Kirchherr, Stuart Sutcliffe and The Beatles is captured in the 1994 film Backbeat with Stephen Dorff as Sutcliffe and Sheryl Lee as Kirchherr.